If you've been following along for a while, you know how much I love my ankle boots! They are my favorite shoe to wear during the fall, winter, and spring months. (Unfortunately, it's too warm here in the summer to wear them comfortably!) I figured it was high time to do a post featuring my army of ankle boots, why I love them, and some outfits I've worn including them. Back when I ordered all the things from ModCloth, I ordered these boots. I had a coupon, and at the time, that meant I could not let it go to waste. I'd say they aren't my normal style, and I can't really pinpoint why I adore them so much...I just do! Maybe I like them because they are so different. Them being different does come with some challenges, though. I have a harder time styling these shoes, but I love when I come up with new outfits featuring them. They tend to make me look shorter since they stop just above my ankle bone. However, I think it's the oxford style that really speaks to me, and the wing-tip adds something extra. I hope to style them more this spring and try something new since I tend to wear them with cuffed jeans. Thank goodness for all of the style inspiration on Pinterest! I love these adorable booties! Aren't they cute?! They are so girly, but because they are grey, they go perfectly with my wardrobe and add some flair to whatever outfit in which I include them. I can tell they aren't the best quality, but they weren't very expensive at less than $50. I've owned them for over a year, though, and they are still holding up well after light use. I love wearing these with dresses and skirts the most. These did have the highest heels in my closet until I purchased my most recent pair of ankle boots, but I find these easy to walk in. Because they have a faux suede exterior, I don't wear them when there is precipitation falling to avoid staining them. I'm glad I bought these to spice up my shoe wardrobe. I find myself buying very basic, highly versatile pieces nowadays and I think it's necessary to add a fun piece every once in a while if it makes you happy! My ankle boot obsession truly kicked off after I purchased these beauties. I had first heard of Madewell after I started blogging in the fall of 2013, and in December, I stopped in a store for the first time...and that was how I blew my budget before I even started budgeting (ha!). I remember drooling over these boots and wishing I had $228 to drop on them, and I remember walking out of the store behind a lady wearing them and feeling SO jealous of her. Three months later, these babies went on sale for a more modest $143, and I HAD to make them mine. They took a very large chunk out of my March budget, but it was so worth it. I adore these boots. I baby them, so they don't get out as much as my black ankle boots, but I love wearing them when the weather is nice. The heel is surprisingly comfortable, and cognac is a beautiful neutral that looks great with everything, even black! I received these boots as a birthday gift last year after wanting them for a couple of months, and let me tell you: I wear them ALL of the time. They are my go-to boots when I'm not sure what shoes to wear because they seem to go with nearly every outfit. (I wouldn't wear them if it was below freezing outside because I always have my ankles exposed, but we haven't really been below freezing that much this winter!) The leather is beautiful, and I haven't had any problems with quality in the few months I've owned them. These replaced my original pair of black ankle boots (the Wanted brand boots I purchased from Delia's two autumns ago, which I still own and wear to concerts since I don't mind if they get a little beat up). At over $100 full price, these boots are on the upper end of what I'm generally comfortable with spending on one item with my grad student budget, but I can say that I 100% recommend these boots if you've had your eye on them. 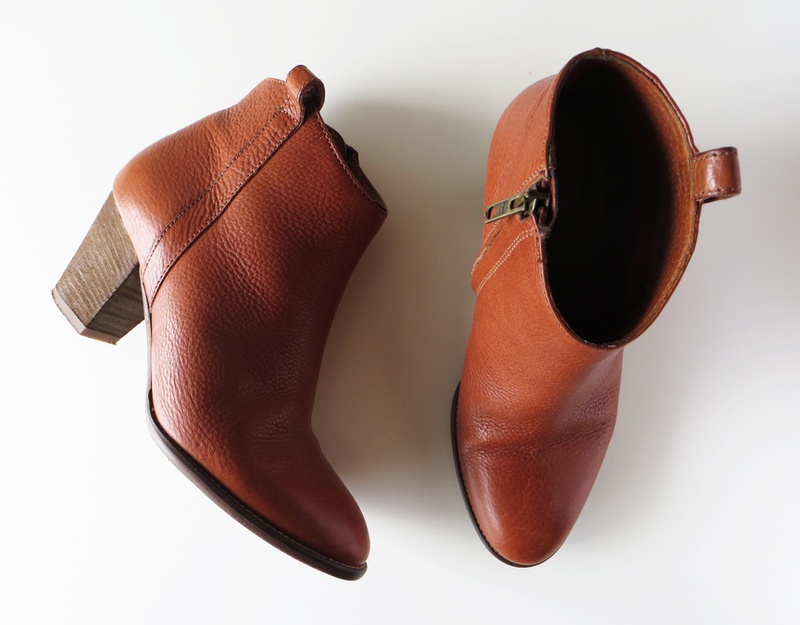 My newest addition, these ankle boots were a love-at-first-sight situation. I had never heard of the brand until Taylor Swift started wearing their boots regularly last fall. Of course, I had to check out & Other Stories, assuming it was a high-end brand (though I love that T. Swift wears more affordable brands, too), and I was pleasantly surprised when I saw that the prices weren't outrageous. It's a little sister of H&M but the aesthetic is less fast-fashion trendy and more high-fashion with some abstract details thrown in for good measure. I snatched these beauties up on sale, and while I wasn't quite sure how I felt about the heel height, they aren't as bad as I thought they would be even though I am still getting used to them (they are my highest heels!). The leather is gorgeous and supple. I'm glad I went with the dark red color because it's different, yet goes with pretty much everything in my closet! I'm definitely going to be keeping an eye on & Other Stories for future fun purchases.